â€¢ The Council were preparing new design standards (complementing the new LCDS) that would help avoid cycling issues falling through the cracks. â€¢ Some discussion on the removal of CS2 at Tramway Ave. Counciloor Christie distinguished this junction from others as (a) not signalised and (b) a sliproad rather than a junction. He indicated that there had been numerous near misses and that it was a question of balancing out providing incomplete protection for cyclists (as complete protection was not practicable) against giving cyclists a false sense of security. Newham Council had responded to the CS2 consultation by asking for CS2 extension to be brought up to the same standards i.e. “hold left turns”. He invited suggestions for improvements. Councillor Christie had no progress to report re Westfield s, but offered to ask the Mayor to write to Andrew Gillighan re need for LLDC to up their game. NC asked that Newham Council engage in favour of improving the cycle facilities in the LLDC planning process. â€¢ Councillor Christie stressed that funding was tight and that highway money would be priorities on surfacing and pavement improvements which were getting particularly poor. NC stressed that for cyclists junctions were a priority. Financial constraints also bore down on the proposed cycle strategy. â€¢ NC suggested a straightforward strategy built upon (a) a network of quietways (b) infilled with permeability measures in urban Newham and (c) 20 mph and (d) protection for cyclists on the relatively few major corridors (Romford and Barking Rds being LCN+ – albeit substandard). Councillor Christie was sympathetic to 20mph, but explained why politically it needed a robust evidential basis, and may be better approached piecemeal. NC were invited to assist in this. They indicated that immediate enforcement problems should not be a problem and 20mph could take effect over the long term. NC raised specifically 20 mph in Woodgrange Rd , but this was not discussed. â€¢ Councillor Christie set out some current activity, particularly where funding was being sought or had been obtained: CS2; the Quietways programme -building especially on the Greenway, Royal Docks walking and cycling programme; the Roding greenway; and Gallions roundabout. â€¢ Councillor Christie had obtained an update on the LCC ward asks: CTN – Leaway funded and in train; CTS – Silvertown Viaduct being looked at; Custom House – route from Building 1000 to UEL being sought from developers; SNT – Stratford gyratory junction improvement being sought from TfL; LI – Roding greenway study funded. He asked NC to look at their ward asks to ensure they were what we really wanted and gave the example of the Beckton roundabout. Posible future engagement with other Councillors discussed. â€¢ NC supported mini-Holland project of Â a routeÂ going past City of London Cemetery and over a new bridge to Ilford town centre. â€¢ Junctions need particular attention,Â with proper crossings. â€¢ Choice of route either Henniker Rd or Chobham Ave balanced. â€¢ 20mph on route and on periphery very important. RW outlined priorities based on (a) what could be achieved bearing in mind 2014-5 needed spending quickly and DfT rules on transport signing facilitating contraflows changed in March 2015 (c) need to spread the work around wards and (d) links to coherent routes. NC to seek to obtain the map of the ward audits etc. Wok on this depended on there being funding left over from the priority section from Canning Town to Silvertown Viaduct including Tidal Basin roundabout. A cycle around revealed there was enough space s-e bound for two way track to link with that starting at West Sivertown DLR, and also a cycle facilities n-w bound using dock road and thus avoiding a difficult slip road. This may need to be held due to closure of tunnel under Sivertown Viaduct and pending development money becoming available. RW asked if NC would be prepared to be trained to help with traffic surveys. 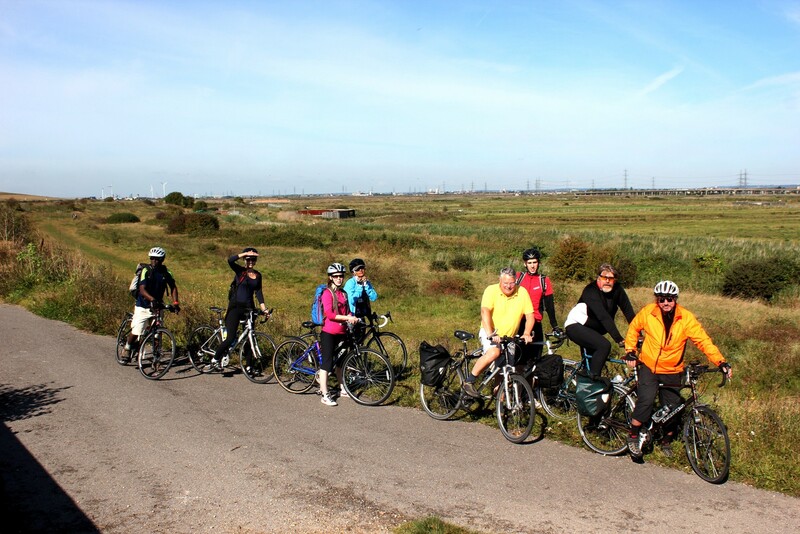 In what is turning out to be a Newham Cyclists tradition, the weather was amazingly good. The ride was enjoyable; 25 miles, mostly off road. Â Particularly notable was the Thames in the autumn light – Â as still as a mill pond. Â Below are a couple of phots, taken by Chris. 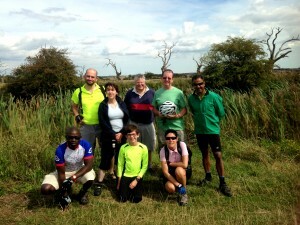 Â The first is the group stopping by the river for a photoshoot and the second on the marsh pathÂ approaching the RSPB. We provided our views on Stratford High Street to Atkins. We decided the committee would pursue a meeting with Councillor Christie. We will take up communication training with a view to creating more targeted communications. East London Hubub rides will be circulated on the Yahoo group. Richard provided a general upbeat update on cycling developments. (1) Consultation has opened on the e-w and n-s Superhighways through Central London; (2) Aldgate to Bow CS2 improvements will go out to consultation , but are likely to include proper protection from left hooks and Â (over 30%) segregation. Â We need to look out a press for left hook protection in Stratford High St. This has opened today – see Â https://consultations.tfl.gov.uk/cycling/eastwest and https://consultations.tfl.gov.uk/cycling/northsouth (3) This week Newham will be submitting an application for funding to remove the Stratford Gyratory, for which the ground has been prepared. (4) Proposals are moving forward for remedial improvements to Westfield Avenue in the Olympic Park, to be paid for by the developers of the International Quarter (5) Newham have employed a further person to deal with cycle projects. (6)The cycle permeability project is progressing to the mapping stage and will be incorporated into a draft cycle strategy for the borough which is being written at the moment. (7) the Lea Valley route will also link Canning Town to the Excel Centre/Cablecars via Sivlertown Way. Â This links to our ward ask for South Canning Town. (8) 200k has been obtained to improve Gallions roundabout. (9) Newham almost doubled its cycle training delivery; it Â is sending all its drivers on Â serious cycle awareness training; and its engineers are getting LCDS (London Cycle Design standards) training . (9) A cycle parking audit has almost been completed picking up on historic suggestions for cycle parking, and 25K is available to spend on cycle parking and decluttering; 14 stands have recently been installed..
Richard exposed the Sustrans proposals for the Aldgate to Hainault quietway route on which immediate comments were offered. Â We will carry out a formal consultation exercise separately. We decided to pursue a response to the river crossings consultation: Â https://consultations.tfl.gov.uk/roads/river-crossings. A ferry at Gallions Reach to Thamemead will reduce traffic on local roads in the south of the borough and create a slight increase on the A406 and a feeder road to it, and bring environmental benefits over upgrading the existing Woolwich Ferry. Â My suggestion is to oppose any new Â bridges – Â which will Â bring traffic too much traffic into the borough bearing in mind the prooposed Silvertown tunnel. 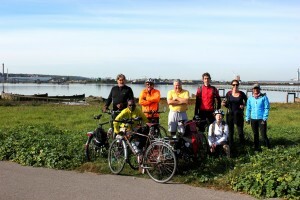 Â Â The Gallions Reach ferry appears the most beneficial to cyclists followed by the Woolwich ferry. Â Comments to me by close 8th SeptemberÂ Â for drafting the response and submitting it by 12th September. Not surprisingly after all this there was not time to look at the Space for Cycling follow up which we will do at our next meeting onÂ 29 September. See separate posting for forthcoming rides. Above: The oaks, but no bikes. Below: Â A high spot en route, this time with bikes. On Tuesday night we had a very pleasant saunter down the canals to a pub in Canary Wharf that turned out to be called the Ledger – and back. Â Some business was transacted as refreshments were taken. We were sympathetic to a collective response to the latest river crossing consultation. It is Â available here: Â tfl.gov.uk/new-river-crossingsÂ Â Do respond as an individual if you are so inclined but whether you do or not let me know what you think and I will collate a newham cycllists response. Â The consultation closes 12 September. 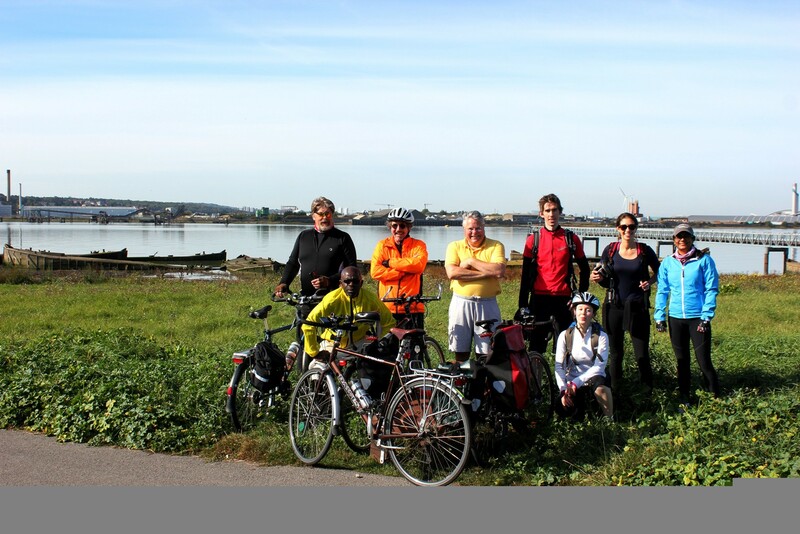 Cody Dock, a regular stop on our Newham Ride has been shortlisted for a publicly voted grant (Â£120,000) for a wild flower park. Â I will let you know when polling is open. Newham and TfL, with assistance from us, are continuing to look at possible quietways and have looked Â at: Greenway improvements, a possible Roding Valley way, a northern route from Stratford to Ilford and the Forest Gate to North Woolwich route. Â These, with the Lea Valley (which is already planned and funded), a southern west-east route (which emerged during the ward audits) and from hte Excel to UEL, would make an excellent foundation for a Newham network of quietways. We will consider the Space for Cycling follow up in September. We are progressing with the possibility of making our 7 September Newham Ride a Councillor focussed rideg; and a meeting with Councillor Christie, who has been notified of recent instances of disappearing cycle racks and registered his concern. We agreed to contribute to Olawale attending the cycle design courses run by Urban Design for London. I am awaiting a meeting with Council officers on Crossrail improvements around Manor Park station. Â If you would like to see the (very early pictures) and comment please let me know. The 25 bus route has been chosen to trial a sensor system to improve cycle safety. Our next meeting will be on 1 September (venue to be confirmed but probably Coffee E7). Â A representative from Atkins will be attending to consult on freight in Stratford High St. 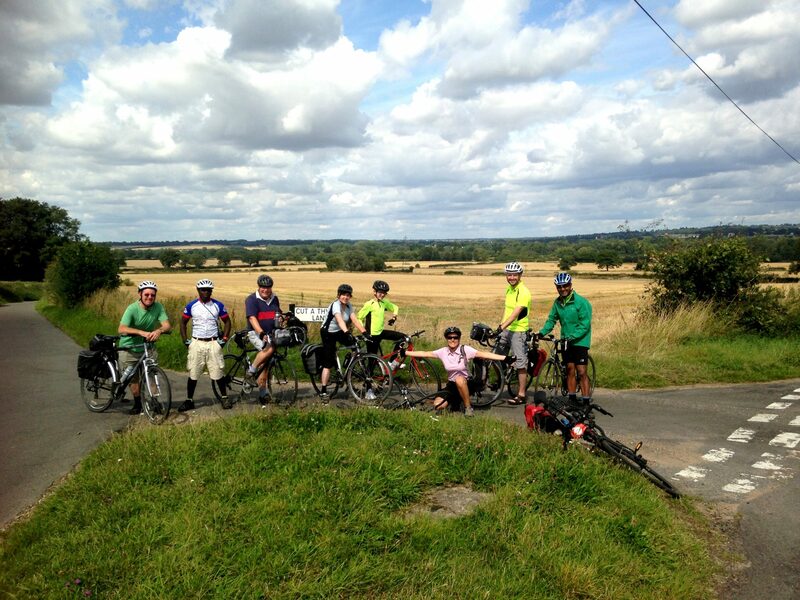 The Essex ride is on 24 August. 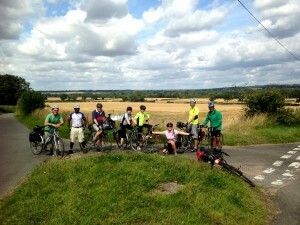 A pleasant ride up the canal last Monday (30 June) with just a bit of business. Â First we will run a furher evening ride onÂ Tuesday 5 AugustÂ for those who have not fled on holiday. Â Usual 7.00pm start at the corner of Sebert and Woodgrange Rds. Â We will wend our way off road to Â Canary Wharf for refreshment. The French themed ride Â is on forÂ Sunday 6 July. Â Breakfast from 9.30 at the View Tube, depart after 10.15. Three of us attended anÂ informal updateÂ with Newham Coucil on outstanding cycle issues. Â In a nutshell:Olympic Park, CS2 from Stratford to Ilford, WestfieldÂ – not off the radar but no news. Removal of cycle Â parking at Leyton Rd and Romford Rd – to be looked into ,Â since when the position on Romford Rd has become worse and more than half the pavement has been removed for car parking. Cycle contraflows on Cramere and Sheringham RdÂ – definitively blocked at the political level, as was a 20mph limit in Upper St.
Warton RdÂ – the Council are looking at a separate cycle lane through the a separate arch in the railway. Cycle officer- Â the funding from TfL for this is not being used for a full blown cycle officer but is being devoted to cycling purposes. We will use our usual Monday evening meeting slot for another summer evening ride, following the success of last month’s. Â This time we will be taking a short ride up the Lea Valley to the Princess of Wales pub at Lea Bridge. Â Meet at the corner of Sebert and Woodgrange Roads at 7.00pm. Â Stratford pick up at the corner of Chobham and Leyton Roads at 7.15pm. Don’t forget the Newham Ride this Sunday 15 June. Â We leave from the View Tube at 10.00am. Â For further details see the forthcoming rides section. Will take place on Tuesday evening 3 June. Â Meet outside CoffeeE7 (corner of Woodgrange and Sebert Rds) at Â 7pm, or corner of Henniker Rd and Leyton Rd at 7.15. Â After a ride around the Olympic Park we will end up at the Wanstead Tap cafe in Forest Gate which is being opened specially. Please could you update me on the progress of re-examining the plans for cycling infrastructure across the Chobham Manor development, as you committed to do in answer to my question on the topic in December (Question 2013/4696)? The approved Reserved Matters application for Chobham Manor has removed the need for cyclists to dismount at junctions on Chobham Manor. Cyclists will now travel on the road, rather than dismounting at junctions. This is appropriate due to the low level of motor traffic expected in the area and followsÂ reasoning that on local streets â€“ such as those in Chobham Manor – if cars know they must share with cycles they will travel at a slower speed. My cycling commissioner, Andrew Gilligan, is working with the LLDC and Westfield to improve cycling provision across Queen Elizabeth Olympic Park. Will you remodel the cycle track on Westfield Avenue in the Olympic Park where cyclists currently have to dodge concrete cobbles every 15m or so? Why did your team allow for such a substandard track to be built? Westfield Avenue, while part of the wider London Legacy Development Corporationâ€™s (LLDC) area, is part of the Westfield Stratford City estate, sitting outside Queen Elizabeth Olympic Park. The original plans for the cycleway were submitted prior to the London 2012 Games and were approved by the Olympic Delivery Authority in line with then guidelines on cycling. If anyone would like like to go (Newham Cyclists will reimburse the cost) Â please let me (Arnold) know. “The major funding committed forÂ LondonÂ highlights a growing political will for ambitious and innovative approaches to improve the public realm and encourage more people to cycle on our road network. With huge commitment for such change, what is the future ofÂ Londonâ€™s landscape? With schemes such as Mini-Holland set to create substantial and transformative change along with the extension of cycle superhighways and funding for Quietways, key questions and challenges start to arise around cycling design standards. How will the competition for space be managed? Is there a need to reallocate road space? How do we encourage and increase cycling numbers without taking away space from modes other than the private car, should we cut into bus lanes and muscle in on footways? AsÂ Londonâ€™s number one borough for cycling, the Hackney Cycling Conference offers unrivalled access and opportunity to exploreÂ these issuesÂ with a cross-sector mix of transport professionals, politicians, academics and campaigners that areÂ involved inÂ influencing an increase in safe cycling in theÂ UK.